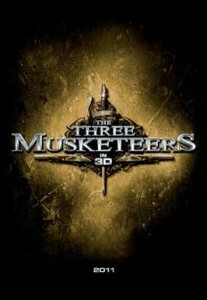 Check Out The Trailer for The New “Three Musketeers” Film!!! Here is the trailer for the brand new “Three Musketeers” film directed by Paul W.S. Anderson (The Resident Evil Films/Alien Vs. Predator) and will star Milla Jovovich, Orlando Bloom, and Christopher Waltz. The trailer for this film looks okay at best, but when you have a director like Paul W.S. Anderson making a film, you can expect something less than desirable. And hell this version doesn’t have Charlie Sheen in it nor Kiefer Sutherland, so how good could it really be?? I joke. Enjoy the trailer below or CLICK HERE FOR THE TRAILER IN GLORIOUS QUICKTIME!!! The Trailer For The ‘Flatliners’ Reboot Is Here!!! Bryan Reviews ‘The Three Musketeers’ 3D Blu-Ray!!! Here’s the Trailer for the Next ‘Resident Evil’ Film!!! Retribution!!! ‘Resident Evil: The Final Chapter’ Gets Release In May!!! This entry was posted on Sunday, March 27th, 2011 at 11:00 pm	and is filed under Film, News. You can follow any responses to this entry through the RSS 2.0 feed. You can skip to the end and leave a response. Pinging is currently not allowed. « Face Off Actors John Travolta & Nic Cage To Share The Silver Screen Once Again!!! Now don't you forget this! Why I should stick my neck out for you is far beyond my capacity!